This project has really challenged my remedial building skills...but it has been fun and a learning experience. I live in a neighborhood with an HOA that doesn't allow backyard chickens, so I'm trying to stay under the neighborhood radar. Fortunately for me, my lot backs up to a home that is not part of our neighborhood. Thus, my biggest concern is concealing the coop and run behind the house. I decided to build it up against the house...it backs up to a storage room that is attached to the rear of the house. 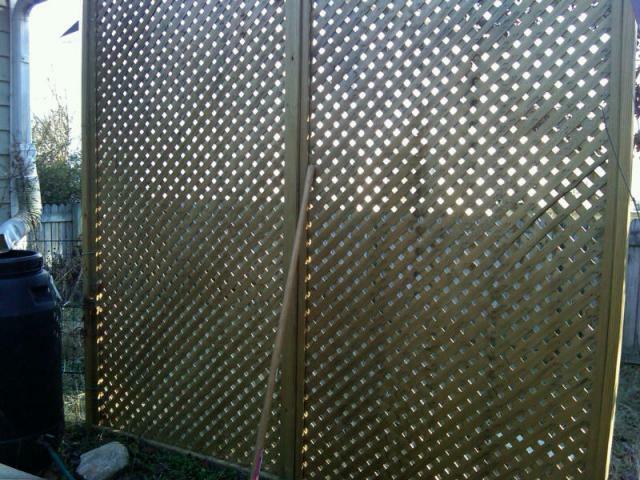 I also built a lattice trellis that will shield it visually from the street and next door neighbors. I plan to plant something climbing and fragrant on the trellis. My backyard is also enclosed by a 4' tall wooden picket fence. Because I needed it to back up to the house, I had to frame, side, and paint the back wall before most everything else so I could maneuver it into place before it got too heavy. That was a trick. The foundation is concrete blocks dug in to ground level. In this North Carolina clay...that was a challenge! I backfilled around the blocks with gravel and concrete mix for stability. The area under the coop will be part of the run and I plan to either fill this portion with Equine Pine or sand. The framing is 2x4's. Some of which I repurposed from a fence that I took down. The siding is 1x4's...which are also repurposed from the fence take-down or were un-used from other projects. The floor of the coop is 1/2" hardware cloth. I will install a removable sub-floor and cover it with shavings during the winter months...but during warm weather, I plan to leave the mesh uncovered for extra ventilation. 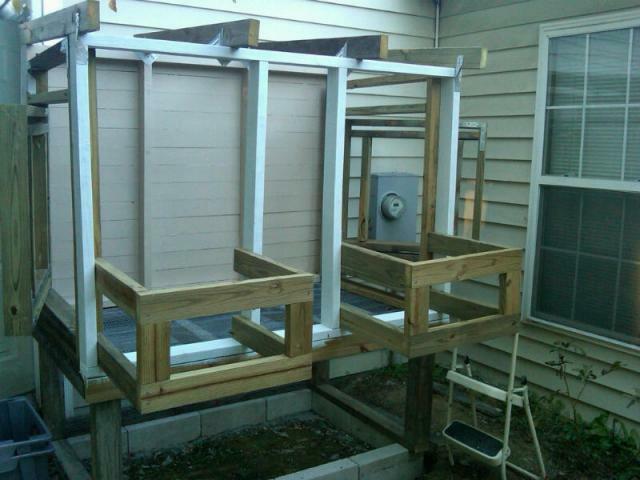 Next I framed in the nest boxes and the doors on either side. 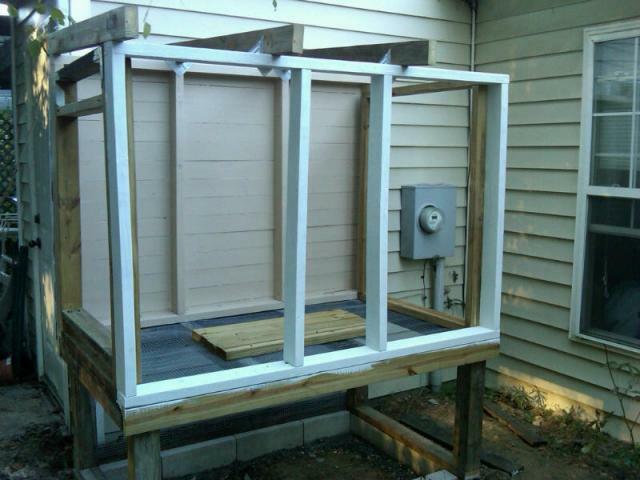 There will be windows in the doors and above the nest boxes. The area under the eves of the roof will also be open for ventilation. My plan was to prime and paint as I went along...but Mother Nature keeps throwing rain and snow at us on my weekend buiding days and I finally decided...to heck with it...I'll prime and paint in the Spring. So, here's where we stand today...under roof (corugated vinyl) and one window installed on the door on the left. Still needs trim and paint....but that will have to come later. 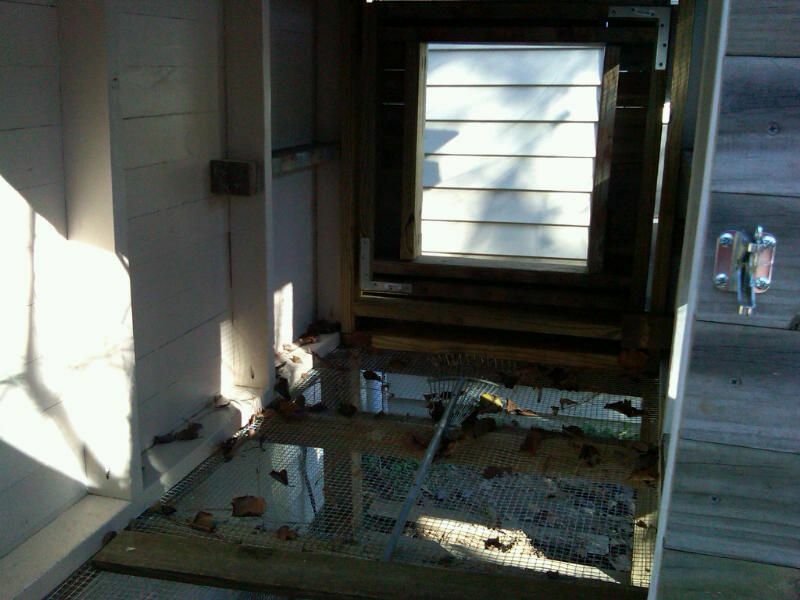 There is clear plexiglass covering the windows above the nest boxes. I'll remove the plexiglass in summer. Next, I need to build the run...which will attach to the front. You can see the pop door between the nest boxes. I didn't build a way for humans to access the nest boxes except from the inside of the coop. That's a project for another day. Here is a shot of the inside almost finished. The roost bars will span across the end near the other door. The plan is to have two at the same height. You can see the support on the left. I've seen these trays at Tractor Supply that I think will fit nicely under the roosts for poop trays. The other option would be to have a single roost span the entire length. The weather man is calling for snow again this weekend...I hope he's wrong. I really want to get the run put up and my girls into their new and improved home! 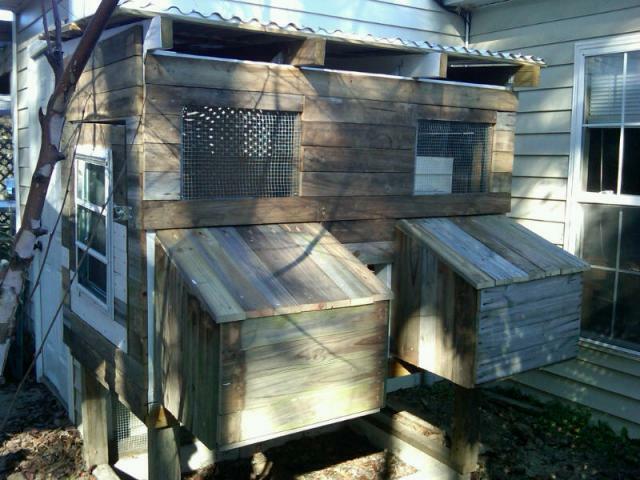 I plan on covering the run with the same corugated vinyl roofing that is on the coop and filling it with sand. I would like to see more details. Not yet finished but I can see where you're going and it looks good so far. IDK how you're going to disguise a run, though.